Last Week in Review: The Jobs Report for February was released. Did the labor market show signs of improvement? Forecast for the Week: The end of the week features key reports on wholesale inflation, retails sales, and consumer attitudes. View: Answering these five questions can help you create a great experience for your clients. "Missed it by that much." Maxwell Smart. For the first time in several months, the number of job creations came in above expectations rather than missing the mark. Read on for details and what this means for home loan rates. Despite the harsh winter weather, 175,000 jobs were created in February. This was above the 163,000 expected, and the largest gain in three months. In addition, there were revisions to the numbers for December and January, adding 25,000 more job creations than were previously reported. The Unemployment Rate ticked up to 6.7 percent from 6.6 percent, while the Labor Force Participation Rate (LFPR) remained at 63.0 percent, a 35-year low. The LFPR measures the proportion of working-age Americans who have a job or are looking for one, and it should be moving higher in a recovery. Overall, this report was a positive sign for the labor market, but more and consistent improvement is still needed. In other news to note, research firm CoreLogic reported that home prices, including distressed sales, rose by 12.02 percent in January 2014 compared to January 2013. January marks the twenty-third consecutive month of year-over-year price gains. And inflation remains a non-issue, as evidenced by the Personal Consumption Expenditures report, which was in line with expectations. What does this mean for home loan rates? Remember that the Fed is now purchasing $35 billion in Treasuries and $30 billion in Mortgage Bonds (the type of Bonds on which home loan rates are based) to help stimulate the economy and housing market. This is down from the original $85 billion per month that the Fed had been purchasing. The Fed will be watching key economic reports closely in the weeks and months ahead. If economic data points are weak, the Fed may have to rethink the tapering it has begun. This will be a key story to monitor as we move ahead in 2014. Economic data is light this week and doesn't begin until Thursday. On Thursday, we'll get a look at consumer spending with February Retail Sales. Also on Thursday, Weekly Initial Jobless Claims will be reported. Last week's claims fell by 26,000 to 323,000, below expectations and the lowest level since November. On Friday, look for February's Producer Price Index, which measures inflation at the wholesale level, as well as the Consumer Sentiment Index for March. 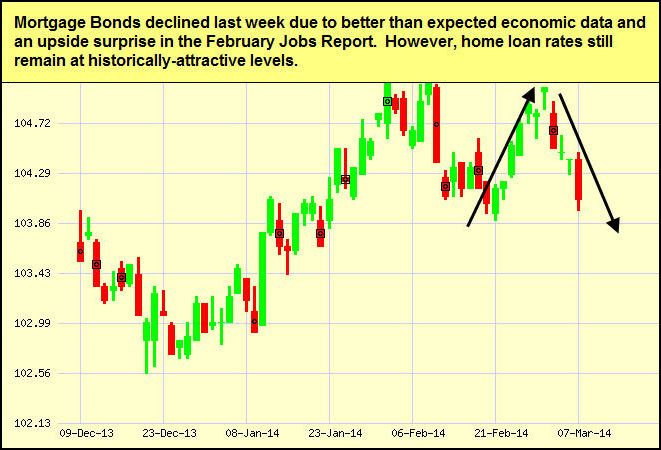 As you can see in the chart below, Mortgage Bonds worsened last week due to better than expected economic data. However, home loan rates remain near historic lows and I'll continue to monitor their movement closely. 1. What makes me different? What you do and how you do it should stand out from the crowd. If it looks exactly the same as everyone else in your line of work, you may not be as successful as you could be. Read 5 Tips for Using Competitive Differentiators to Build Your Business Brand. 2. Do I tell people I'm different? You may have the greatest system or service in the world, but if nobody knows it, your business will fail. Read 7 Tips for Getting Your Marketing Message Right. 3. How is my voice? Making sure you and your employees communicate a distinct and consistent message in person, on the phone, and over social media is critical. 4. Am I building a community? Get active on social media, make friends in your community, and figure out ways to become well-known within circles of influence that can feed clients to you. Ideas include fundraisers, charity events, civic events, and even workshops you host. 5. Am I reliable? Make sure you have thorough and tested systems in place so you don't get the kind of reputation that could kill your business.